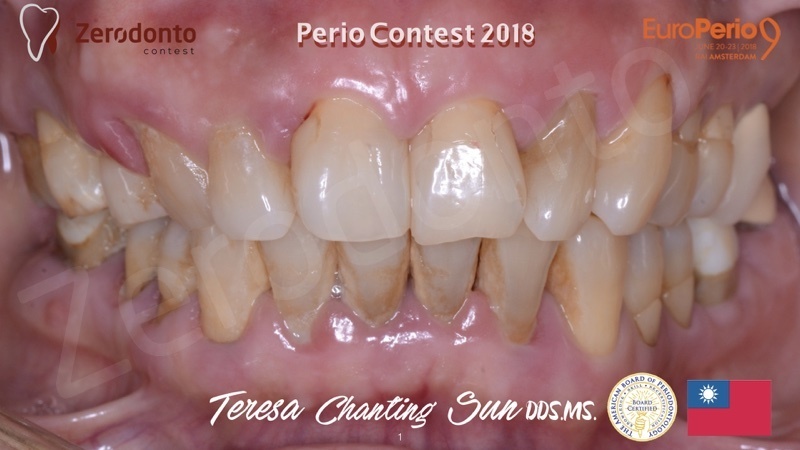 45 year-old, female patient applied to our clinic with too many missing teeth, and with teeth in a poor perio situation and bad esthetics. 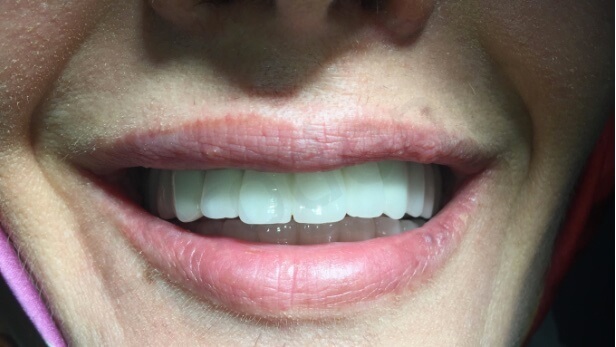 She has been wearing removable denture for the lower jaw for about 15 years. Panoramic and tomographic analyses were done. 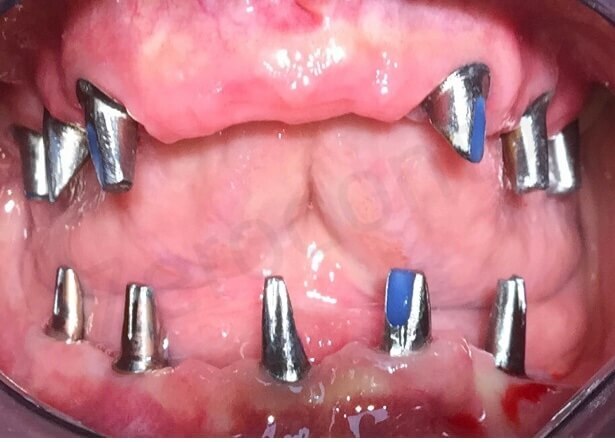 All the teeth were decided to be extracted and immediate implantation was planned. 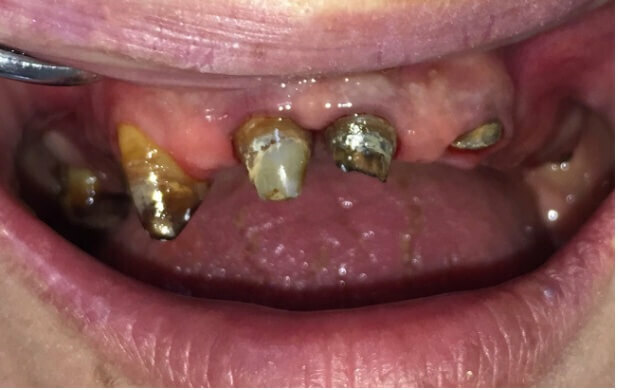 However, the remaining bone was very insufficient, patient insisted to have fixed temporary bridges in both jaws. As seen in the tomographic cross sections, the remaining bone after extraction was so thin and short. No enough bone volume for primary stability. 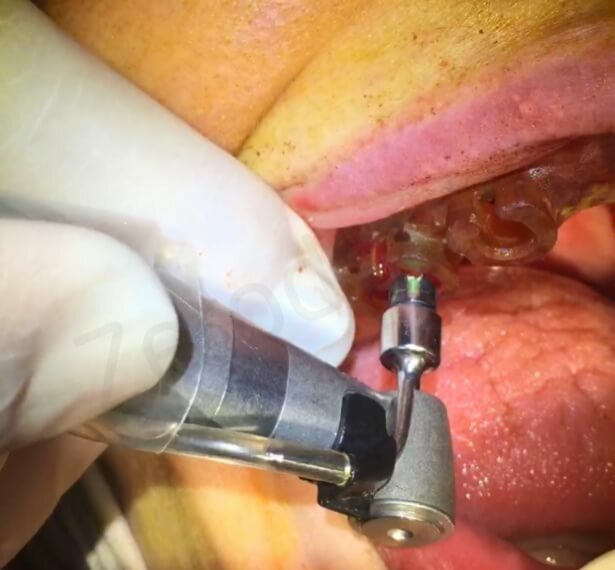 Megagen’s R2Gate system was decided to be used for the whole procedure to manufacture custom abutments according the planned prothetic situation. A good bite registration was taken and confirmed. 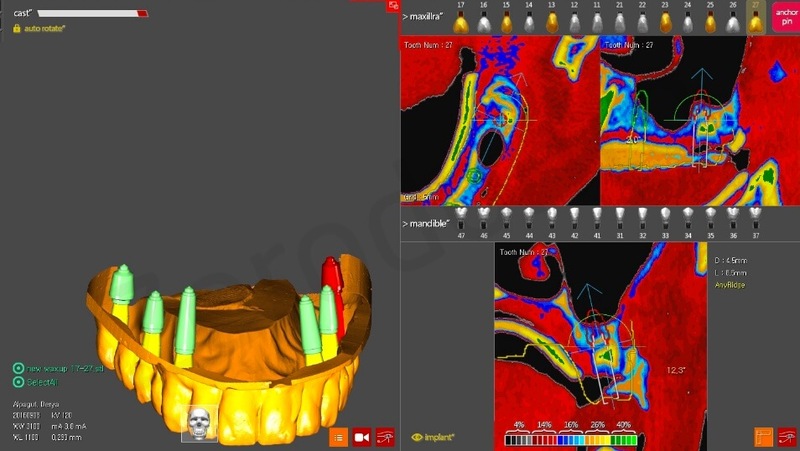 Impressions of both jaws were taken to copy the same shape of the bridges and the occlusion. A radioopaque plate was done for lower implant and stent planning. Stents and custom abutments were prepared by in cooperation with R2Gate Milling Center in Turkey (the report enclosed). 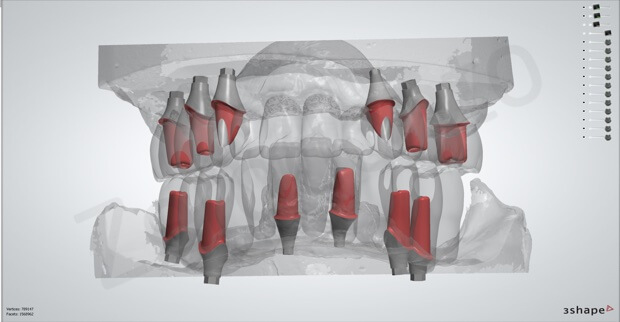 Non-hex abutments were chosen for some of the implants to have the freedom of paralleling if need be. Upper jaw was operated first. All the teeth removed, stent was fixed and implant holes were prepared. 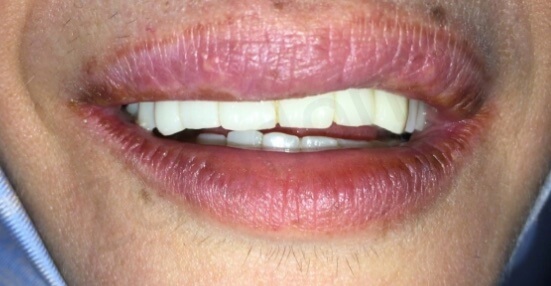 The distal implants on both sides were too short. 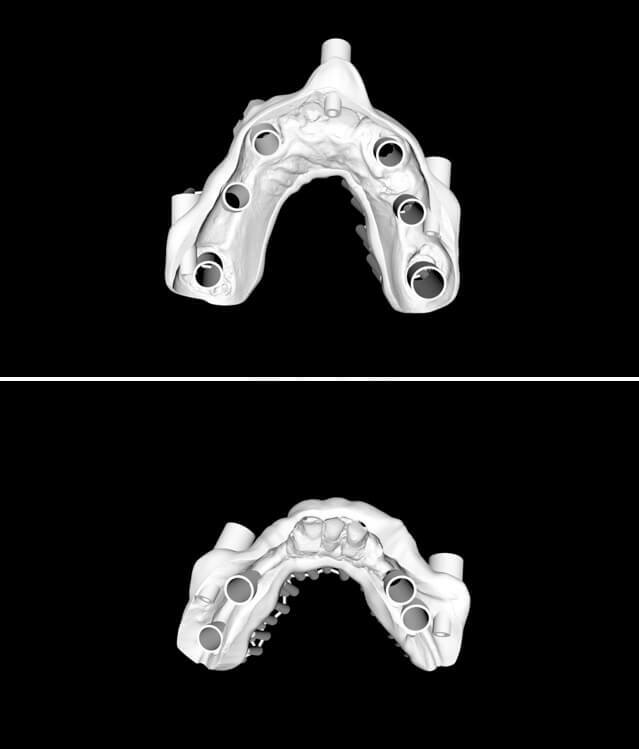 So we decided not to fix the bridges to them however, 3 of the remaining implants were very loosely fixed in the bone without any primary stability. It was soo loose that, the abutment screws could not be tightened just by hand, no torque value was reached. Impression taken right after the surgery and sent to the lab. The lower jaw was operated in 2 stages. 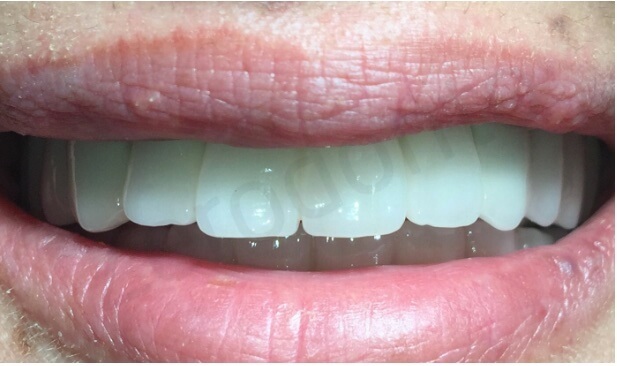 The anterior teeth were used to fix the stent primarily while placing the posterior implants. 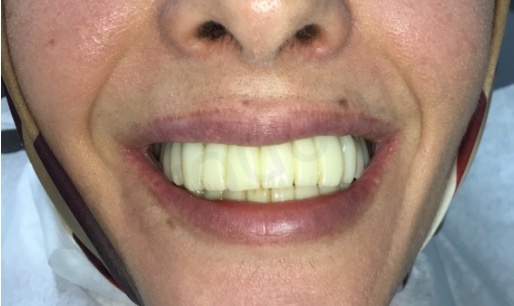 After placement of the posterior implants, anterior teeth were extracted and the R2gate gingiva formers were used to fix the second stent during the drilling and placement of anterior implants. R2Gate systems stent and drills are used as in the description below. 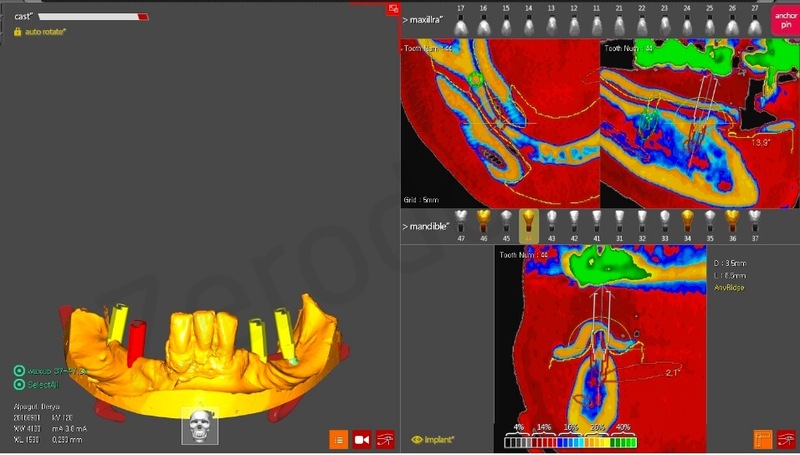 – implant hex is positioned according to the green vertical line on the carrier which should fulfill the guideline window on the hole for the implant in the stent. 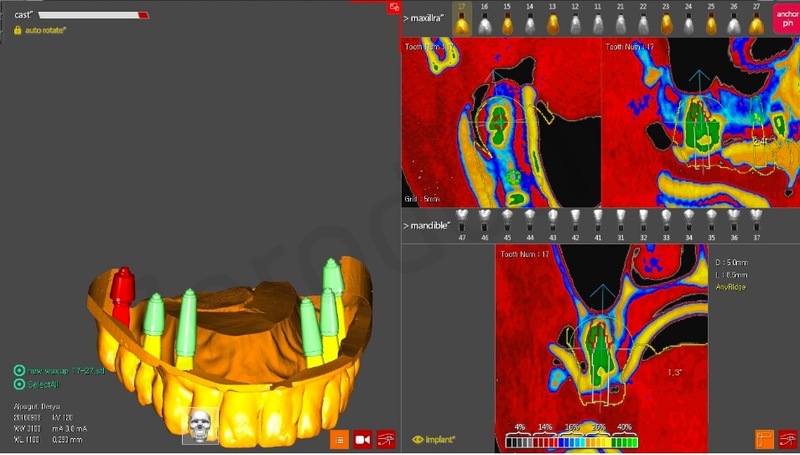 However, 6 implants were planned for the lower jaw, there were no bone left lingually of the left distal implant. So we decided not to place it. 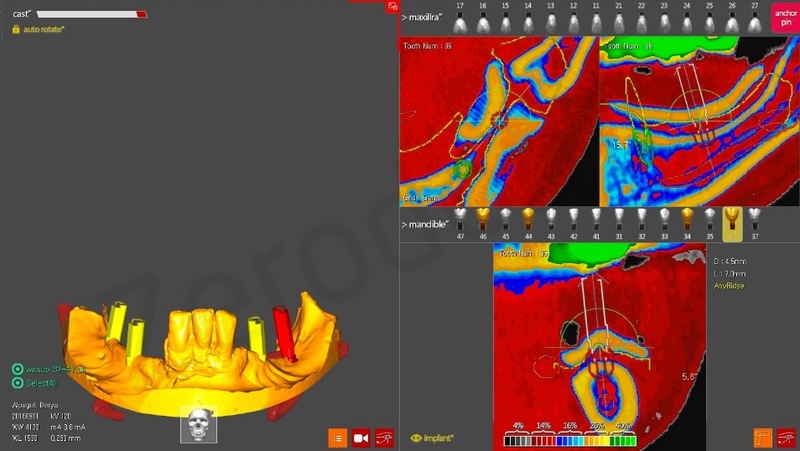 After placing the lower implants, impression was taken and sent to the lab. Then after, both upper and lower bridges were cemented the same evening. 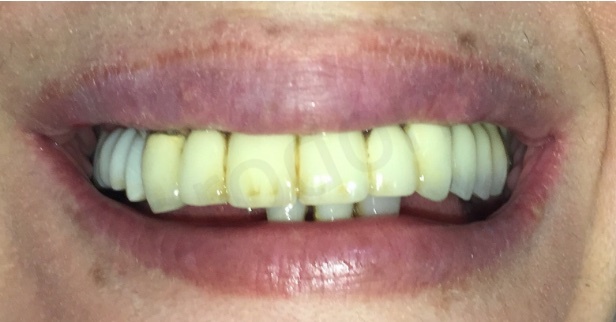 Patient was motivated on not biting anything hard on the teeth, educated on brushing, flossing and plaque controlling. The day after, patient was controlled. She had very little swelling and nearly no pain. 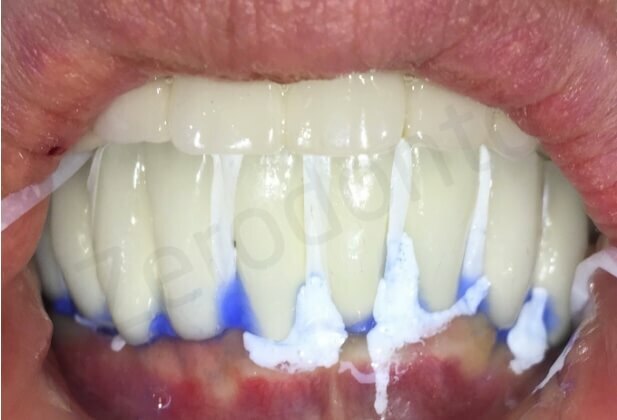 Patient came 3 months later. The ISQ values were measured by means of MegTorque, which were between 69-78. There were no plaque. The temporary bridges and the gum were in a very good condition. After radiologic control, so permanent loading was decided. Temporary bridges were removed. Nearly all the abutments were completely mobile as they could not be torqued enough because of the insufficient primary stability. All were tightened. 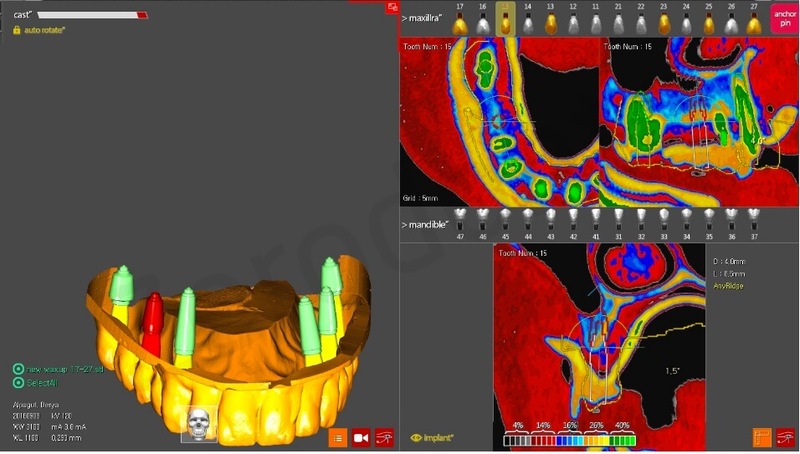 The impression of the upper distal implant were taken and for custom abutment manufacturing. 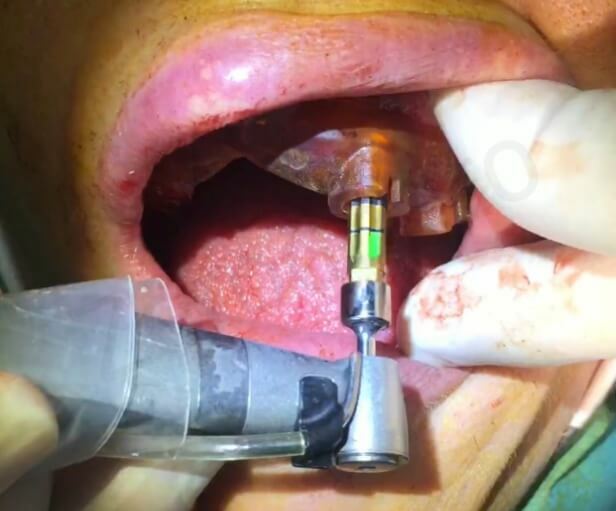 In the meanwhile, some adjustment were needed at the gum-implant borders after healing.It was done by high speed handpieces. Then the abutments were completely tightened by ratchet according to manufacturers advises. 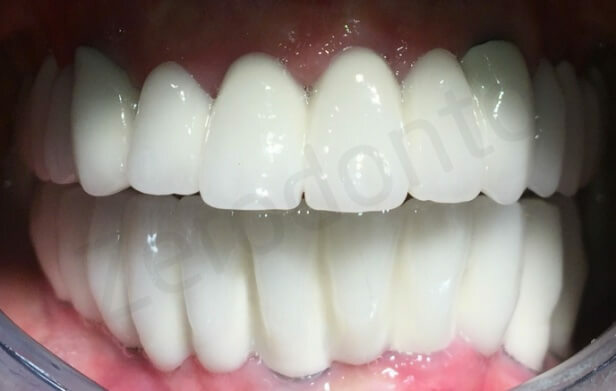 Final impressions were taken and one piece PFM bridges were manufactured in about 7 days. During this period, a new temporary bridge was made for the patient. 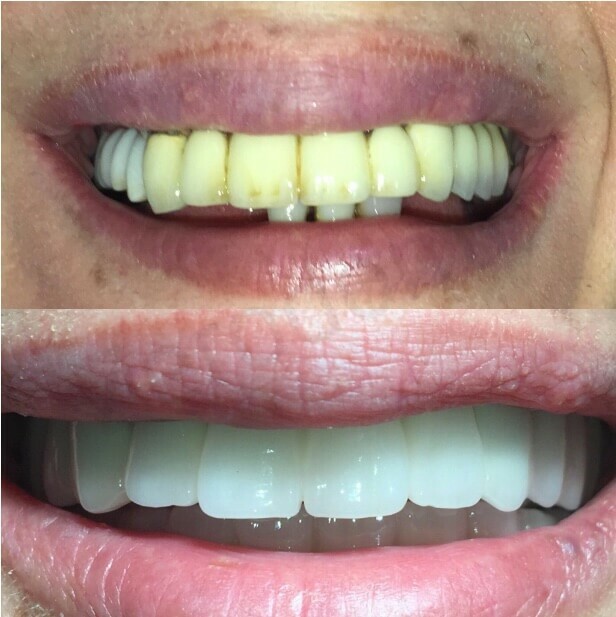 The final result was pleasant and satisfactory for both us and the patient as seen in the pictures. The bridges were cemented with pre-wrapped flosses and water soluble vaseline applied to the margines for easy cleaning after cement cured. A nearly impossible to immediately-loading case was finished with an unexpected success.